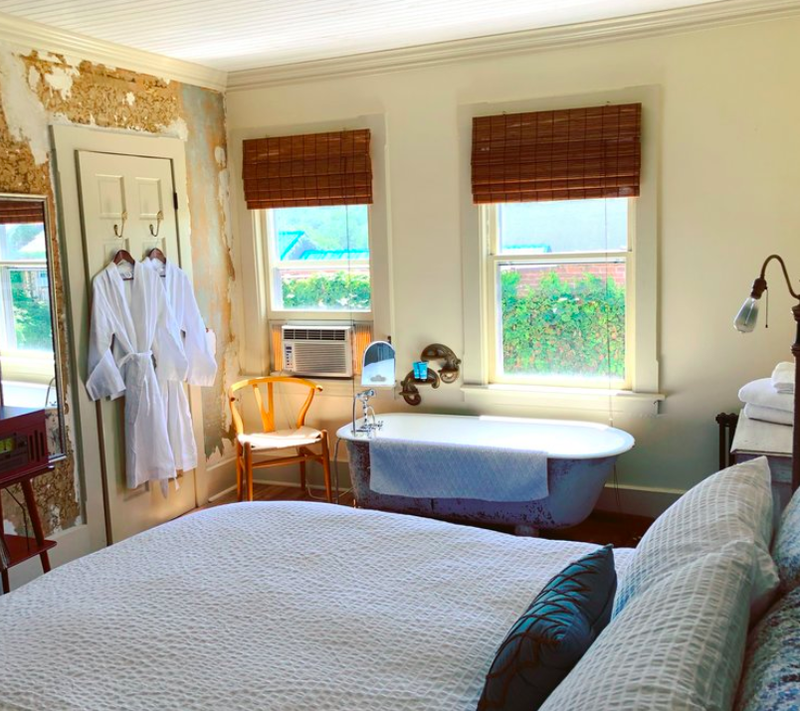 The Rooms • Moonriver Inn Moonriver Inn is nestled in the heart of Narrowsburg and the Catskill Mountains, on the banks of the Delaware River. The pet-friendly Inn offers modern hotel rooms, each uniquely decorated with a mix of modern and antique furnishings and artwork. 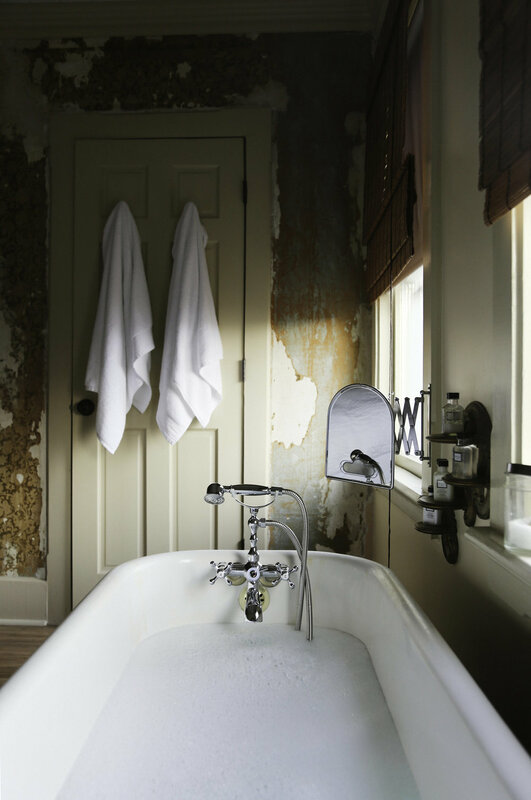 Enjoy a relaxing soak in the clawfoot tub, with complimentary mineral salts and bubble bath. Lounge on the couch and around the cafe table and seating area, catching up on your latest book. 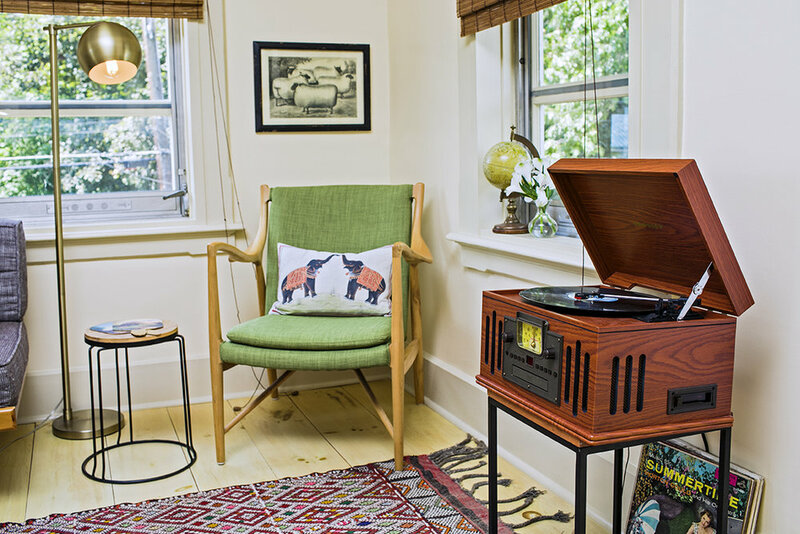 Listen to old records on the turntable or play your favorite tunes over the bluetooth stereo. Watch your favorite shows on the SmartTV, with Netflix, Amazon Prime Video, HBO and other customizable channels. Soak the tensions away in the clawfoot soaking tub in the room. Mineral salts and bubble bath provided. Relax on the antique fainting couch, reading your favorite book or listening to vinyl on the turntable. Facing the east, this room affords a beautiful view of the sunrise over the Catskills. Enjoy your morning cup of complimentary coffee or tea at the cafe table. Recline on the fainting couch, whiling away the hours listening to your favorite music on the bluetooth stereo or the turntable. Unwind and ease into the slower pace of country life.